If your teeth are crooked its never too late to make correction. Ortho treatment can be considered at any age. It should be considered for malocclusion or bad bite, which can put extra forces while chewing and can even lead to decay or gum problems. It can also lead to excessive wear of tooth surfaces and jaw joint problems. To correct these problems braces is a perfect choice as it uses acceptable forces to gradually move the teeth to desired position. No matter to what they look during the treatment, the result is a perfect smile and correctly positioned teeth. This treatment is beneficial both functionally and cosmetically. 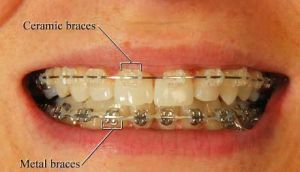 Braces can be fixed (Begg’s / Straight Wire) or removable type and can be selected based on individual needs. Removable braces are not as effective as fixed type. Braces can be metallic or cosmetic (ceramic). These days another option known as lingual/invisible braces is also available, wherein the braces are placed behind the teeth, and not visible from front. Our lingual orthodontist will examine and confirm what kind of braces will best suit your condition. How long will Lingual orthodontic treatment take? Lingual Orthodontic treatment may involve moving a single tooth or it can involve complete jaw. Usually braces need to be kept for 6 – 24 months with lingual orthodontic adjustments and monitoring every 4 to 8 weeks. This is followed by placing a retainer to hold the teeth in their new position for further periods of up to 18 months. What is the right age for Lingual Orthodontic Treatment? Early treatment (for 7- 9 year olds) could result in shorter and less complicated procedure. The treatment attempts to influence bone growth for better and faster results. Treatments for teenagers are also are very effective. Treatments for adults are longer than for children. However, a vast majority of those taking Lingual Orthodontic treatments are still adults. Visit 32strong to meet the best Lingual Orthodontist in Delhi. Call +91-9811302367 for an appointment.